I work as a person who is always looking for new ways, new designs, new ideas. This process has helped to engender a certain attitude and way of being that I think is of enormous benefit to people in all walks of life. The flash of the “a-ha!” moment is not one that is limited to artists, but is the essence of our own creative natures. As a new discovery, my own “A-ha!” moment helps to till new ground in my own creative life, bringing me many benefits, so too can this same flash of realization serve to shift lives, attitudes, beliefs, and change how we feel, sometimes in small ways and sometimes in big ways with how we see the world. This is the essence of inspiration. Some might want to put a label on it, but the truth is, I have found, that whether it is a deep spiritual or religious epiphany or whether I have just discovered the next big thing, the feeling is precisely the same. It is transportive, a word I just made up, and it opens us up and breaks us out of our old notions and feelings from just a moment prior. This is the essence of new discovery within ourselves. This effect is liberating and healing. It also has a curious effect of dispelling fear, too. With such an abundance of wonder and possibility, it is hard to see the world in such limiting ways that we did a moment prior. And I don’t intend to try and crash the religious epiphany to the ground, but to point out that its root lies in all of the world; it lies in each of us and it is curious that when we do find it, the world does indeed change. We are, in a word, renovated by just such a presence in our lives. So whether you are a Buddhist, Christian, Muslim, or Zoroastrian, or an artist who calls art or design his or her spiritual home, the effect and thrust of the experience is the same. It is something that is quite literally beyond belief! When I work with art students or with the public at my studio, I see the effect that this sense of discovery and wonder can do. It is a liberating effect. It is liberal in that is frees us. No longer limited by being caught in old belief or notions of what is possible, we see the impossible emerge right in front of us. 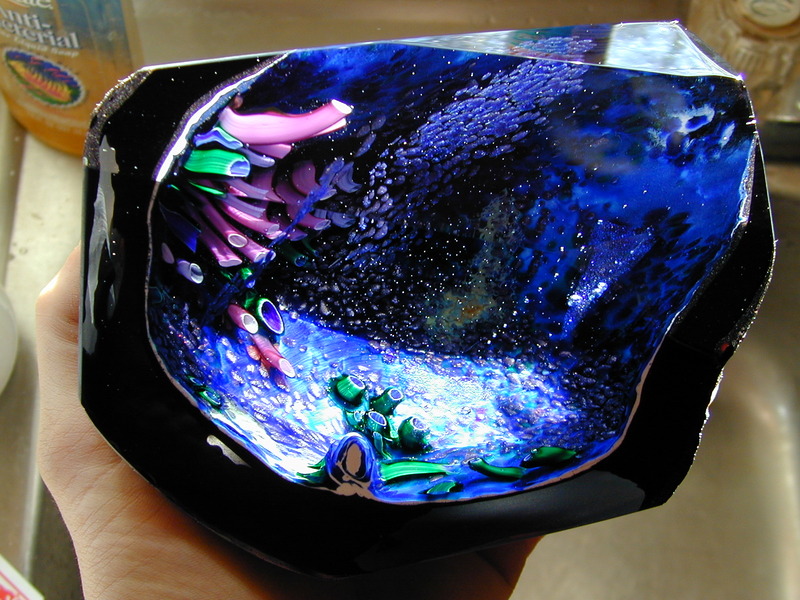 I suppose that since glass itself is such a miraculous material that this helps engender this feeling in many who do workshops at the studio. When we erase fear, wonder remains. I tell people who blow glass for the first time that even if they do drizzle glass on the floor of the studio, the material is so beautiful that picking up those drizzles becomes a moment of discovery and wonder. And they do. Just this past holiday season I had a child who drizzled glass and felt bad about it. I patted her on the back and said not to worry. After she had finished her piece, she went back to the drizzled glass and picked it up. She took it home with her because, well, glass is just that beautiful. So with a material like that, its not hard to help people to tap their own inner wonder. Remove the fear or anxiety and what remains is wonder. It is this way in every realm of our lives from religious, social, political and creative. Just a thought for your lovely July morning…..